Laser, Nd:YAG or IPL for Facial Thread Veins? Laser, Nd:YAG and IPL may all be suggested as high-tech, injection-free treatments for facial thread veins – but they are not the same thing at all. Which is best? The two systems work in a different way. IPL machines are more likened to a very bright light. This light is polychromatic, not collimated, and delivers a broader spectrum of light energy, which may then be filtered to exclude certain wavelengths but still leave more than one. This is less precise than laser and therefore targets multiple colour chromophores. Therefore there is the risk of surrounding tissue receiving the IPL energy as well as the target. This is why many professionals will not recommend IPL for treating thread veins in olive or darker skin tones. Laser machines emit a monochromatic, collimated (parallel) and coherent light. Thanks to this precision, lasers target a single colour chromophore; which in the case of thread vein removal is haemoglobin; leaving the surrounding tissue untouched. In all cases, the basic principle of treatment is to damage and destroy the veins, which are then broken down by the body and removed by the immune system and metabolic processes. However, systems which achieve this result in a gentle manner leaving the surrounding tissue intact give a more agreeable result with less inflammation, reduced redness and lower risk. This means that Nd:YAG is the treatment of choice for those professionals fortunate enough to have access to the equipment. Cosmedics Skin Clinics’ main London Vein Treatment Centres in Harley Street and Putney offer the sophisticated Harmony XL Pro Laser treatment, which uses Nd:YAG technology to target problem capillaries, vessels or veins with targeted laser energy. This damages the veins so that they shrink, shrivel up and then disappear. 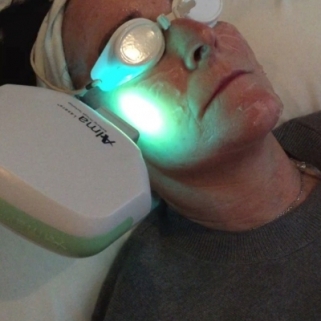 Laser energy also works to stimulate healing and cell renewal in the treated area for clearer-looking skin. It is a gentle and effective treatment for facial thread veins on the face. https://www.veintreatmentcentre.co.uk/wp-content/uploads/laser-thread-vein-treatment.jpg 400 400 News https://www.veintreatmentcentre.co.uk/wp-content/uploads/The-London-Vein-Centre.jpg News2019-02-18 16:51:142019-02-18 16:51:14Laser, Nd:YAG or IPL for Facial Thread Veins?